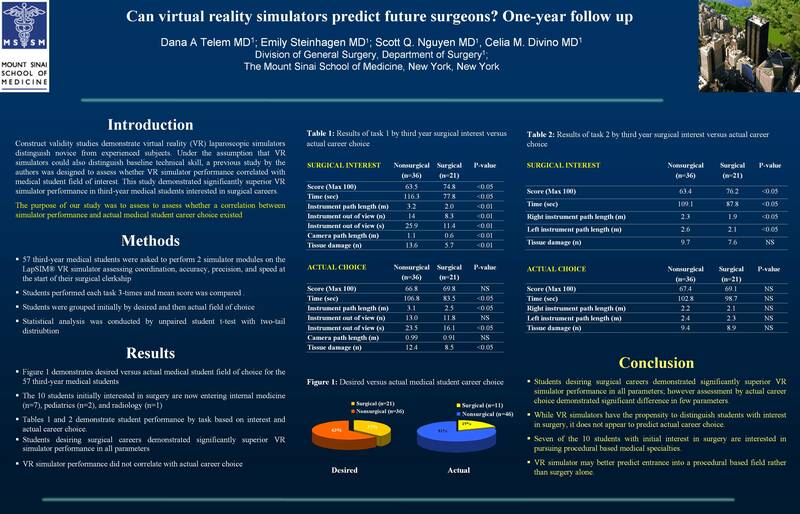 Introduction: A previous study performed by the authors demonstrated significantly superior VR (virtual reality) simulator performance in third-year medical students interested in surgical careers. The purpose of this study was to assess whether a correlation between simulator performance and actual medical student career choice existed. Methods: Fifty-seven novice third-year medical students performed two simulator tasks assessing coordination, accuracy, precision, and speed at the start of their surgical clerkship. Students performed each task 3-times and mean score was compared. Scores were correlated with desired and actual career choice. Univariate analysis was conducted by unpaired t-test. Results: Of the 57 students; 35(43%) initially desired non-surgical careers and 21(37%) had interest in surgery. Following completion of the third-year, 46(81%) are entering non-surgical fields and 11(19%) surgical fields. The 10 students initially interested in surgery are now entering internal medicine(n=7), pediatrics(n=2), and radiology(n=1). Table 1 shows student performance based on interest and actual career choice. Performance was significantly superior for students desiring surgical careers but did not correlate with actual career choice. Conclusion: Students desiring surgical careers demonstrated significantly superior VR simulator performance in all parameters; however assessment by actual career choice demonstrated significant difference in few parameters. While VR simulators have the propensity to distinguish students with interest in surgery, it does not appear to predict actual career choice. Of note, 7 of the 10 students with initial interest in surgery are interested in pursuing procedural based medical specialties. VR simulator may better predict entrance into a procedural based field rather than surgery alone.